Ever since news broke on the 23rd of August that the SEC were reviewing all 9 Bitcoin ETF denials, there has been a rejuvenation in the crypto markets that is self evident with a stable BTC. Since then, the King of Crypto has been slowly climbing from levels of $6,300 seen earlier on that day of the 23rd, to current levels of $6,700. Many crypto traders are enthusiastic that we might see Bitcoin levels of around $7,000 by mid next week. In the mean time, the alternative coins have taken this opportunity of a stable Bitcoin and a general good feeling in the markets, to post impressive gains. 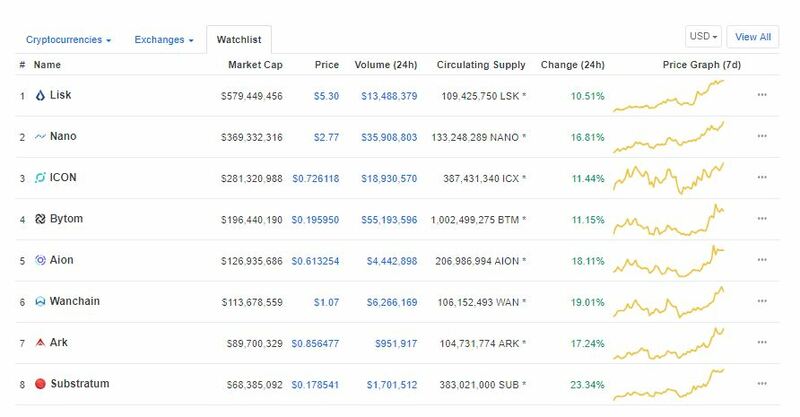 Eight of these top 100 coins according to coinmarketcap.com, are leading the pack with double digit gains in the last 24 hours. A better visual of the market action can be seen in the screenshot below. Further analyzing the list, we find that Lisk (LSK) is up 10.51% in 24 hours to current levels of $5.30. LSK was also a victim of the recent market decline due to the SEC postponing the CBOE sponsored Bitcoin ETF. At its recent low on the 14th of August, LSK was valued at $2.73. NANO is doing well with 16.81% in gains in the last 24 hours. On the 14th of August, the digital asset was valued at $0.81 indicating a growth of over 200% since then. ICON (ICX) is experiencing over 11% in gains and is currently valued at $0.726. At its lowest on the 14th, ICX was valued at $0.50. Bytom (BTM) is currently valued at $0.195 and up 11.15%. Aion (AION) is also doing well with 18.11% gains in the last 24 hours. The digital asset is currently valued at $0.61 at the moment of writing this. Wanchain (WAN) has not been left behind and is currently up 19% and trading at $1.07. ARK is also experiencing double digit gains at 17.24% and currently valued at $0.856. Substratum (SUB) is also up 23.34% in the last 24 hours and trading at $0.178. Signs of A Good Week Ahead? With the total market capitalization maintaining levels above $200 Billion in the last one week, this stability might be taken as a sign that we are no longer on a downward trend. There is also the theory that Summer time in the Northern Hemisphere had resulted in many crypto traders taking vacations and cashing out on their crypto to fund activities such as travelling. Their absence could be the reason we were experiencing low volumes in the markets since late May. With the Summer season over, we could see a slow increment in volume as we head into the Holiday season.